In August 2009 we were contacted by William P. Hood Jr., a flatware collector, researcher and writer. William is the author of the definitive book on 19th century Tiffany silver flatware "Tiffany Silver Flatware 1845-1905" and more than 50 articles on flatware published in "The Magazine Antiques and Silver Magazine". He was interested in writing an article on the Imperial Hotel silverware in our collection. "It has recently come to my attention that Frank Lloyd Wright designed silverware for the Imperial Hotel, and I would like to write an article on this subject for Silver Magazine. Are you aware of any other silverware designed by Frank Lloyd Wright?" 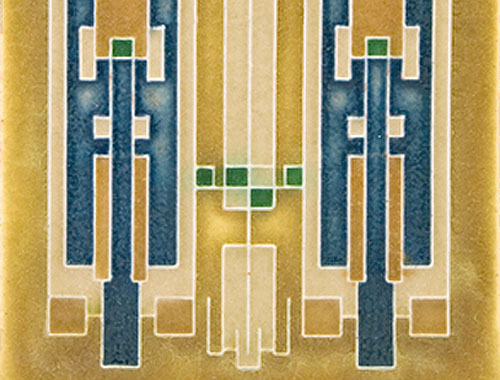 The Auburn Cord Duesenberg Automobile Museum in northeast Indiana, which has two Frank Lloyd Wright's cars in their collection, was displaying "fifty authentic and authorized Frank Lloyd Wright prints... from April 25 until October 25, 2009." The exhibit overview continued, "Frank Lloyd Wright is generally regarded as one of the world's greatest architects. His impact goes beyond the architectural world. By creating designs for furniture, textiles, flatware, and more, he surrounded us with unique objects of beauty, making our lives richer and more meaningful." William contacted the museum and later informed us that the series of Frank Lloyd Wright design drawings from the John E. Christian Memorial Trust (Samara House) on exhibition, which had indicated that it included drawings of flatware designs, turned out to be incorrect. We responded that we did not believe Wright actually designed the silverware. 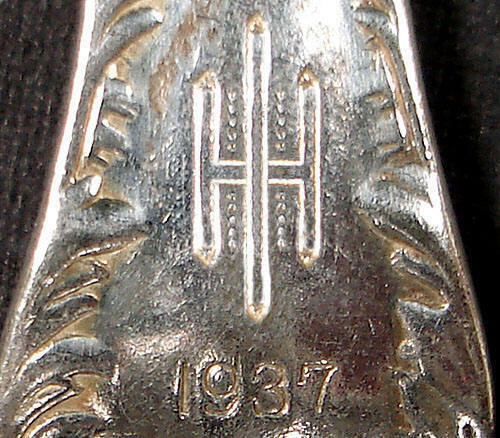 He may have designed the monogram (logo) on the silverware, but we have not had the opportunity to verify this. We would lean toward Wright designing the monogram, or at least conceptually. The silverware does not fit his style, but the monograph does. He did design china, and the Imperial Hotel Coffee Service set, but we were not aware of any silverware he may have designed, which is an interesting question, seeing that he designed so many other items such as furniture, art glass windows, sculptures, carpet, fabrics, wallpaper, books, murals, lighting, china and vases, to name a few, even including dresses. No detail was to minute. This did prompt us to further our research. Text by Douglas M. Steiner, Copyright December 2009. Imperial Hotel History: In 1887, the Imperial Household along with other public figures took steps to build the first Imperial Hotel. A three story wooden structure opened for business in November 1890 and was also called Teikoku Hoteru (Imperial Hotel). The 1890 hotel was designed in the French Second Empire style by a Japanese student of the Rokumeikan's architect, Englishman Josiah Condor. By 1910 this facility proved inadequate. According to Kathryn Smith, "Frank Lloyd Wright and the Imperial Hotel: A Postscript" Wright was first recommended to the Imperial Hotel by his friend Frederick W. Goodkin and was contacted by them in 1911. 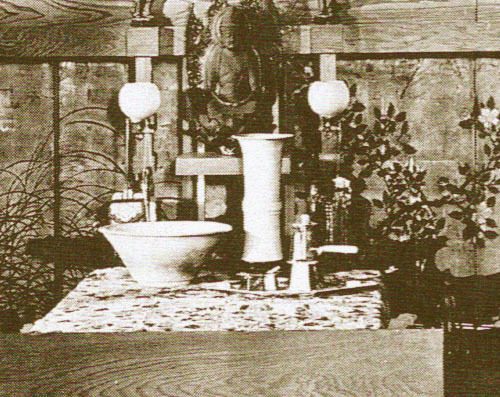 Wright's first trip outside the United States was to Japan in 1905. 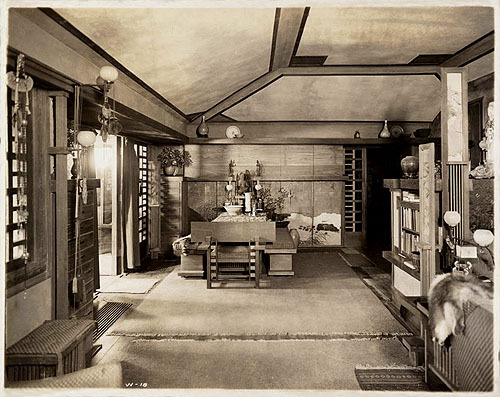 "Frank Lloyd Wright�s Fifty Views of Japan". His interest in and knowledge of Japanese art and prints made him a perfect fit. V 12, plate 61 & 62. These initial conceptual drawings are surprisingly true to the completed hotel. Wright was commissioned and began designs in 1915. In February 1916, Aisaku Hayashi and his wife Takako visited Taliesin to review plans and drawings. It was this visit that Takako Hayashi was photographed in Taliesin's living room. Construction stalled until 1919 and on July 4, 1922 the first section of Wright�s Imperial Hotel opened. In August 1923 the hotel was complete. An official luncheon was scheduled on September 1, 1923 to celebrate completion and the official opening of the Imperial Hotel. Just minutes before the luncheon was to begin, a major earthquake destroyed Tokyo. The Imperial Hotel stood. A Tribute to Wright. On December 1, 1952 the first annex was opened. Construction on the second annex began on January 21, 1957 and was completed on July 31, 1958. On November 15, 1967 the doors were closed and Wright�s Imperial Hotel was demolished. Text by Douglas M. Steiner, Copyright December 2009. 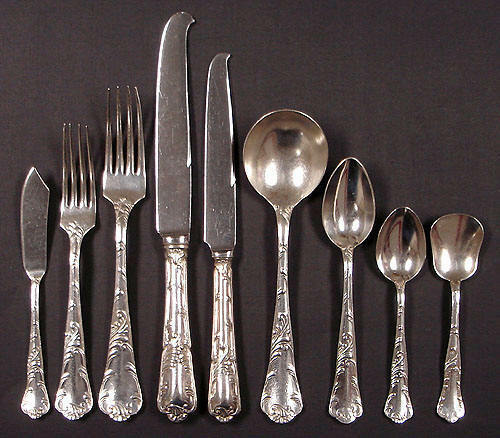 The Imperial Hotel silverware collection is comprised of 26 pieces. From left to right. 1) Two butter knives. 2) Three salad forks. 3) Four forks. 4) Four large knives. 5) One small knife. 6) Four soup spoons. 7) Three spoons. 8) Four dessert spoons. 9) One sugar spoon. The back of each piece is engraved with the Imperial Hotel "Monogram" and is dated. From left to right top photograph. 1) Two butter knives: 1964(2). 2) Three salad forks: 1958, 1961(2). 3) Four forks: 1951, 1953, 1960, 1961. 4) Four large knives: 1958, 1961 (3). 5) One small knife: 1961. 6) Four soup spoons: 1951 (2), 1953, 1961. 7) Three spoons: 1954, 1961, 1962. 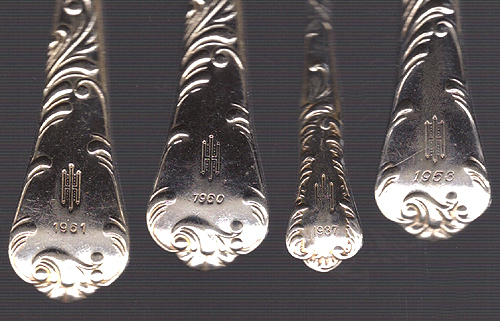 8) Four dessert spoons: 1959, 1960, 1961 (2). 9) One sugar spoon: 1937. There are no other identifying marks. The date changes, but the logo remains the same year after year. Detail of the back. 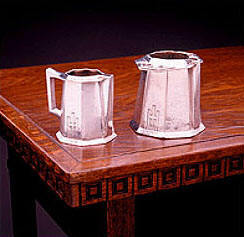 Each piece is engraved with the Imperial Hotel "Monogram" and is dated. There are no other identifying marks. The date changes, but the monogram remains the same year after year. Wright was commissioned and began designs in 1915. Construction stalled until 1919 and on July 4, 1922 the first section of Wright�s Imperial Hotel opened. In August 1923 the hotel was complete. On September 1, 1923 a major earthquake destroyed Tokyo. The Imperial Hotel stood. A Tribute to Wright. 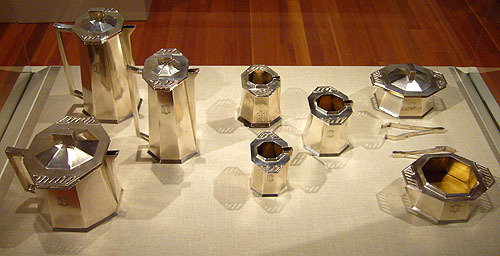 Wright produced drawings for a Coffee Service, which included the coffee pot, sugar bowl and creamer. The illustration included the side and top view. The original design included an "IH" monogram on each piece. In 1979, in "Designs", page 134, Hanks dated this drawing at 1916. In 1988, the Frank Lloyd Wright Foundation dated the drawing 1922 (Decorative Designs, p 21). Courtesy of the Frank Lloyd Wright Foundation. Detail of the side view of the sugar bowl (left), coffee pot and creamer (right). The original design included an "IH" monogram on each piece, each a variation on the monogram. Detail of the photo above, Imperial Hotel Creamer (center back piece). This is the only piece pictured above with the "IH" monogram. Related: "The Wright Stuff" Views from The Figge Art Museum - Fall 2009, pg 4, Exhibition includes Imperial Hotel coffee service. Related: ; "Frank Lloyd Wright, Complete Works 1917-1942" Pfeiffer 2010, page 114. 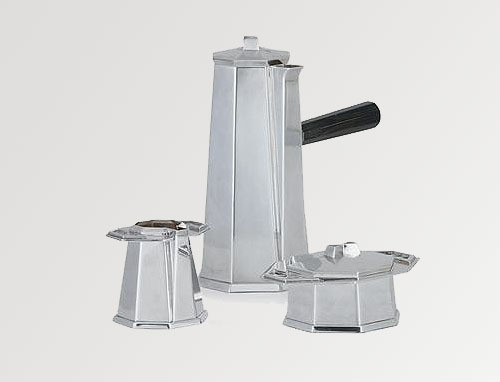 In 1986, Tiffany & Co. entered into an agreement with the Frank Lloyd Wright Foundation to produce the Imperial Hotel Coffee Service, among other items. These designs were technically difficult to execute and as such, were costly and limited in number. 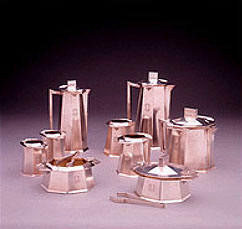 This three-piece coffee service included a sterling silver coffee pot, creamer and sugar bowl. Coffee pot (with palisander wood handle): 9.25" high, 4.5" wide. Creamer: 3.5" high, 3.75" wide. Sugar bowl: 2.5" high, 6.25" wide. Set of three pieces in 1988: $9,500. 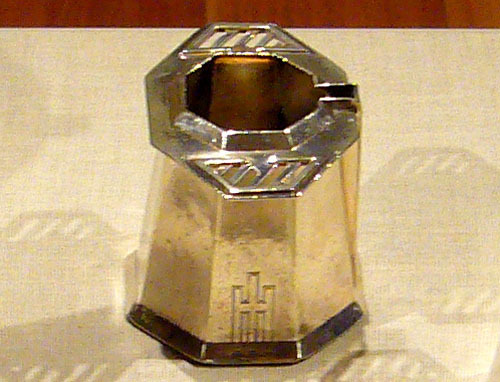 Tiffany & Co. produced a set of Salt and Pepper Shakers that were designed for the Leerdam Company in 1930, but not executed, which used the same hexagonal motif. Tiffany & Co. also produced two large Covered Bowls (14" and 15.75" wide), designed for the Leerdam Company in 1930, also not executed, which used the same hexagonal motif (matching the sugar bowl). Courtesy of Tiffany & Company. For additional information see "Frank Lloyd Wright, Decorative Designs Collection", 1988, 1990. Detail of the Sugar Bowl with cover, produced by Tiffany & Co. Sugar bowl: 2.5" high, 6.25" wide. 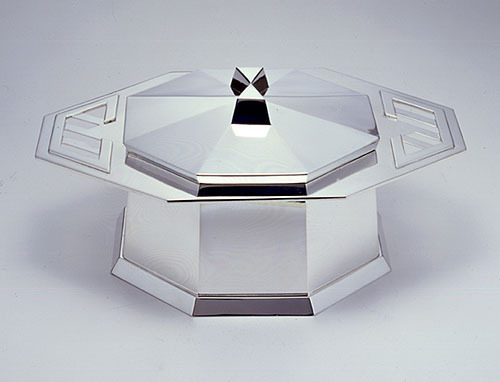 Tiffany & Co. also produced two large Covered Bowls (14" and 15.75" wide), designed for the Leerdam Company in 1930, not executed, which used the same hexagonal motif (matching the sugar bowl). details of other photographs we realized it to be the side panel of an Auditorium seats (Fig. 2 and 3). Wright produced over 700 drawings for the Imperial Hotel between 1915 to 1922. One drawing of the Auditorium (Fig. 4) included Auditorium seating. 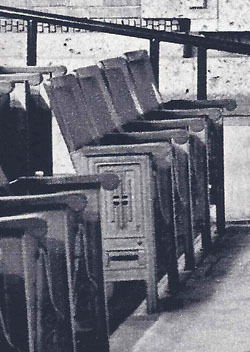 Upon a closer look, the "IH" monogram was designed into the seating. Text by Douglas M. Steiner, Copyright September 2010. (Fig. 1) "Frank Lloyd Wright in Imperial Hotel" Akashi, 1972, page 334. (Fig. 2) "Frank Lloyd Wright in Imperial Hotel" Akashi, 1972, page 105. (Fig. 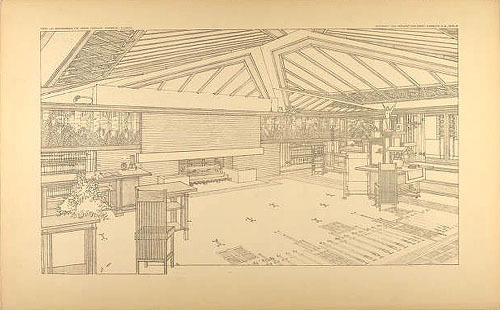 3) "Frank Lloyd Wright in Imperial Hotel" Akashi, 1972, page 110. (Fig. 4) "Frank Lloyd Wright in Imperial Hotel" Akashi, 1972, page 202. (Fig. 5) Detail of seating. Illustration enhanced by Douglas M. Steiner. (Fig. 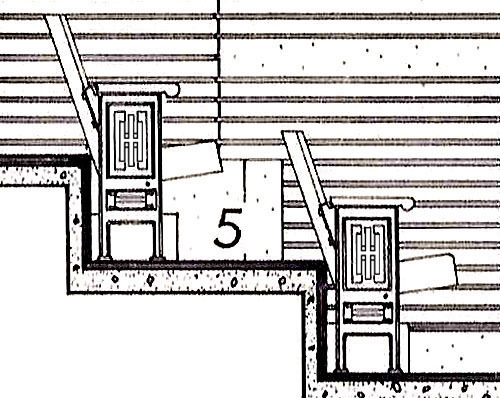 6, Left) Detail of seating. (Fig. 1, Right) Illustration enhanced by Douglas M. Steiner. Birds-eye perspective of the Imperial Hotel. 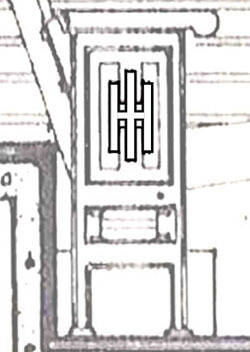 Not only does the "IH" monogram represent the floor plan of the Imperial Hotel, but also a stylized "IH". Not only does the "IH" monogram represent the Floor Plan (left) of the Imperial Hotel, but also a stylized "IH" (center and right). 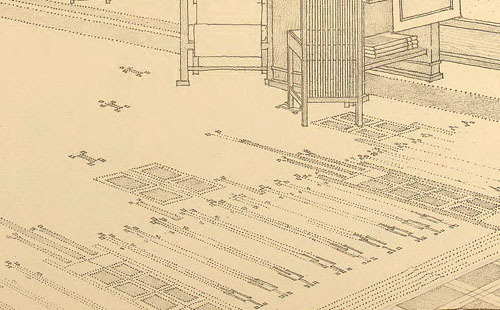 The "IH" monograph variation, Wright designed for the sugar bowl on the original drawing included two horizontal lines, much like the floor plan. 1) Dining Room, Taliesin I, Circa 1911. Frank Lloyd Wright began building Taliesin I in 1911. On August 15, 1914, one of Wright's recently hired domestic workers murdered Mamah, both her children, three of Wright's associates, and a son of one of the associates. He set fire to one wing of Taliesin I, which gutted the Living Room. On January 28, 2005, the Wisconsin Historical Society purchased an important photo album on eBay that included important photographs documenting Taliesin I between 1911-1912. One of those photographs included an image of the Dining Room. 2) Dining Room, Taliesin II, 1915. Published in The "Architectural Record", October 1915. This is the first published interior of Taliesin II. This would have been taken after the fire of August 15, 1914, and after rebuilding, but before August, in time to go to production for publishing in October 1915. Probably taken in July or August, 1915. Many changes between Taliesin I and II are visible. The Dining Room chairs are different. The five panel Chinese screen behind the table is taller. The wood grain in the panels above the Chinese screen is different. The squares in the top corners of the ceiling. 3) Dining Room, Taliesin II, Circa 1917-1919. There are many similarities which date image 2 and 3 close together. The vase on the top shelf in the far left corner. Many items decorating the dining room table are exactly the same. The print and print stand on the far right atop the end table are the same. But there are also subtle changes that would date it at a later time. The adjustable wall lamp on the left has been adjusted differently and has been adorned. The print stand on the left has been moved. The ceiling in the far left corner has added triangles. The "idol" that was on the far right has now been moved to the dining table centerpiece. The small throw rug that was running horizontally just to the right of the dining table is now placed vertically. The Winged Victory model on the right has been replaced by a vase. The book shelves are now full of books. A third print stand has been added as well as matching wall lamp on the right. A pelt has also been draped over a chair on the far right as well as the dining room bench on the left. There are many more plates and vases. But what is most interesting is the Imperial Hotel Coffee Service that appears in this photograph (detail 3a). published in V 3, ill 275 and dated 1911. In 1979, Hanks published "The Decorative Designs" and points out (p 132) "At least one silver coffee service was executed to this design, as it appears in a photograph of the dining-living room at Taliesin II in Spring Green (Hitchcock, pl. 177). The cream pitcher (pl. 12) is the only piece to survive today... The monogram seen in the drawing was not executed. A Japanese maker's marks are stamped on the bottom of this piece." It is clear that this is an Imperial Hotel Coffee Service set (detail 3a). So this begs the questions. When was the set designed? When was it executed? Did Wright design it before the Imperial Hotel, for a different project? Is this photograph misdated? In 1913 while Wright was in Japan he drew up preliminary drawings. Wright was commissioned and began designs in 1915. According to Pfeiffer V 9, p 194, Wright produced over 700 drawings for the Imperial Hotel between 1915 to 1922. Construction stalled until 1919. In August 1923 the hotel was complete. In 1979, in "Designs", page 134, Hanks dated the drawing of the Coffee Service at 1916. 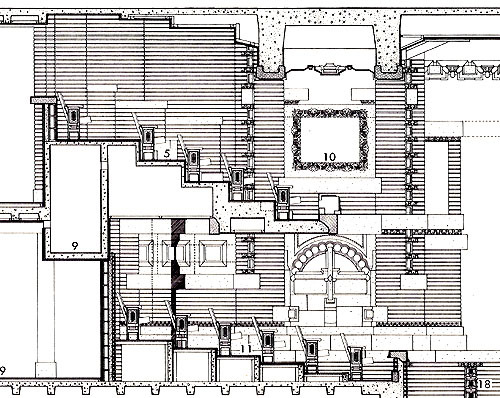 In 1988, the Frank Lloyd Wright Foundation dated the drawing 1922 (Decorative Designs, p 21). If Aisaku Hayashi and his wife Takako visited Taliesin in February 1916, to review plans and drawings, it doesn't seem that a coffee server would be a high priority. They could have brought a prototype with them, but that would mean the drawing of the coffee server would have been one of the earlier drawings. It seems more realistic that it would have been one of the later drawings, and Wright would have brought the server home with him on one of his sixteen trips (V 9, p 194) to Japan. If image 1 has been verified as 1911, and image 2 was taken between May through August 1915, taking all of this into account, the similarities between image 2 and 3, and the timing of the Coffee Service it seems more realistic that this photographs would have been taken in 1917-1919. One additional footnote. In "Taliesin 1911-1914", 1992, Anthony Alofsin published three images of Taliesin II: Fig 11 (Image 3 below), Fig 12 and 13 (Living Room). Fig 13 is dated Circa 1915. When you study the details of these three photographs it becomes clear that they were all photographed at the same time. 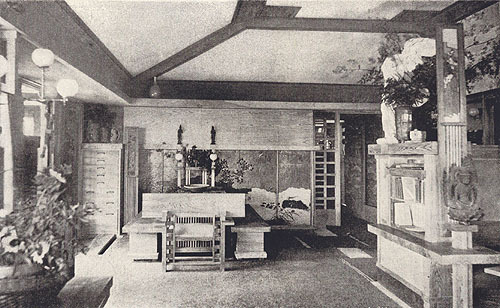 Fig 14 is Takako Hayashi in the Living Room at Taliesin in February 1916. When you compare the background in this photograph with Fig 13, it becomes clear that they were not photographed at the same time. This would answer the question "Did the Hayashi's bring the set with them?" The answer is no. 4 & 5) Dining and Living Room, Taliesin III, Circa 1926-1927. In April 1925, fire struck Taliesin again and destroyed the living quarters. Wright rebuilt again, expanding and enlarging the Dining and Living Room. Text by Douglas M. Steiner, Copyright December 2009. 1) Dining Room, Taliesin I, Circa 1911. Wright began building Taliesin I in 1911. On August 15, 1914, it was destroyed by fire. On January 28, 2005, the Wisconsin Historical Society purchased an important photo album on eBay that included important photographs documenting Taliesin I between 1911-1912. One of those photographs included this image of the Dining Room. Courtesy of the Wisconsin Historical Society. 2) Dining Room, Taliesin II, 1915. Published in "The Architectural Record", October 1915. This is the first published interior of Taliesin II. This would have been taken after the fire of August 15, 1914, and after rebuilding, but before August, in time to go to production for publishing in October 1915. Probably taken in July or August, 1915. Many changes between Taliesin I and II are visible. The Dining Room chairs are different. The five panel Chinese screen behind the table is taller. The wood grain in the panels above the Chinese screen is different. The squares in the top corners of the ceiling. Courtesy The Architectural Record. 3) Dining Room, Taliesin II, Circa 1917-1919. There are many similarities which date image 2 and 3 close together. The vase on the top shelf in the far left corner. Many items decorating the dining room table are exactly the same. The print and print stand on the far right atop the end table are the same. But there are also subtle changes that would date it at a later time. The adjustable wall lamp on the left has been adjusted differently and has been adorned. The print stand on the left has been moved. The ceiling in the far left corner has added triangles. The "idol" that was on the far right has now been moved to the dining table centerpiece. The small throw rug that was running horizontally just to the right of the dining table is now placed vertically. The Winged Victory model on the right has been replaced by a vase. The book shelves are now full of books. A third print stand has been added as well as matching wall lamp on the right. A pelt has also been draped over a chair on the far right as well as the dining room bench on the left. There are many more plates and vases. But what is most interesting is the Imperial Hotel Coffee Service that appears in the photograph (detail 3a). This photograph was first published in "In the Nature of Materials" Hitchcock, 1942, plate 177. In 1979, Hanks published "The Decorative Designs" and points out (p 132) "At least one silver coffee service was executed to this design, as it appears in a photograph of the dining-living room at Taliesin II in Spring Green (Hitchcock, pl. 177). The cream pitcher (pl. 12) is the only piece to survive today... The monogram seen in the drawing was not executed. A Japanese maker's marks are stamped on the bottom of this piece." It is clear that this is an Imperial Hotel Coffee Service set (see detail below). So this begs the questions. When was the set designed? When was it executed? 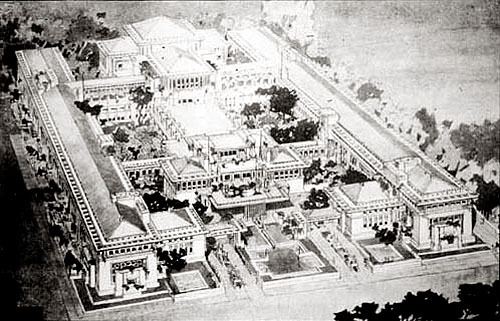 Did Wright design it before the Imperial Hotel, for a different project? Is this photograph miss-dated? In 1913 while Wright was in Japan he drew up preliminary drawings. Wright was commissioned and began designs in 1915. According to Pfeiffer V 9, p 194, Wright produced over 700 drawings for the Imperial Hotel between 1915 to 1922. Construction stalled until 1919. In August 1923 the hotel was complete. In 1979, in "Designs", page 134, Hanks dated the drawing of the Coffee Service at 1916. 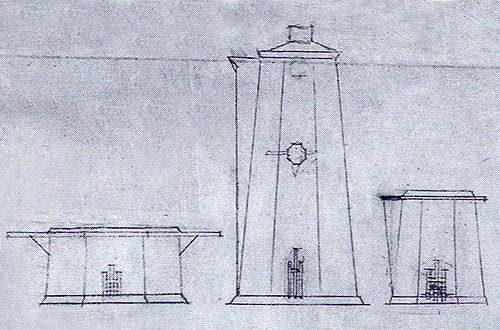 In 1988, the Frank Lloyd Wright Foundation dated the drawing 1922 (Decorative Designs, p 21). If Aisaku Hayashi and his wife Takako visited Taliesin in February 1916, to review plans and drawings, it doesn't seem that a coffee server would be a high priority. They could have brought a prototype with them, but that would mean the drawing of the coffee server would have been one of the earlier drawings. 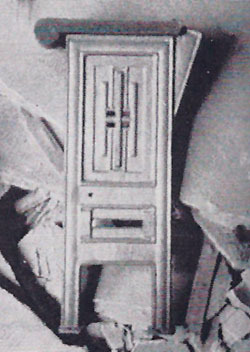 It seems more realistic that it would have been one of the later drawings, and Wright would have brought the server home with him on one of his sixteen trips (V 9, p 194) to Japan. If image 1 has been verified as 1911, and image 2 was taken between May through August 1915, taking all of this into account, the similarities between image 2 and 3, and the timing of the Coffee Service it seems more realistic that this photographs would have been taken in 1917-1919. Photographed by Henry Fuermann. 3a) Detail of the Dining Room table. In 1979, Hanks published "The Decorative Designs" and points out (p 132) "At least one silver coffee service was executed to this design, as it appears in a photograph of the dining-living room at Taliesin II in Spring Green (Hitchcock, pl. 177). The cream pitcher (pl. 12) is the only piece to survive today... The monogram seen in the drawing was not executed. A Japanese maker's marks are stamped on the bottom of this piece." It is clear that this is an Imperial Hotel Coffee Service set. 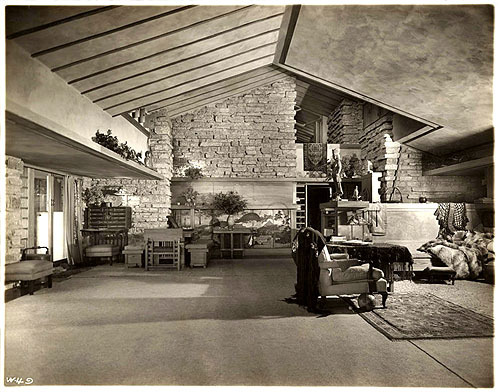 4) Dining Room (left) and Living Room, Taliesin III, Circa 1926-1927. In April 1925, fire struck Taliesin again and destroyed the living quarters. Wright rebuilt again, expanding and enlarging the Dining and Living Room. (Notice the ball and baby rattle under the chair in the foreground, for their daughter Iovanna.) Photographed by Henry Fuermann. 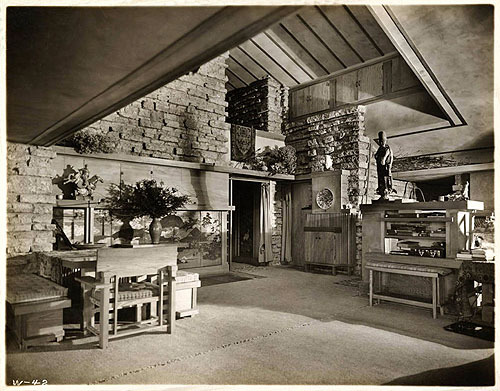 5) Dining Room (left) and Living Room, Taliesin III, Circa 1926-1927. In April 1925, fire struck Taliesin again and destroyed the living quarters. Wright rebuilt again, expanding and enlarging the Dining and Living Room. Photographed by Henry Fuermann. Excerpts: In 24 years, Jim and Janeen Marrin amassed a fortune in Arts and Crafts furniture and decorative objects by scouring swap meets and junk shops. "It's one of the seminal collections of Arts and Crafts in the United States," says Nancy McClelland, director of 19th- and 20th-Century decorative arts at Christie's in New York, who has organized semiannual period auctions since 1982. "They've put it together brilliantly. They understand what it is they've collected. They both have great eyes." Indeed, catching dealers unawares has been the couple's modus operandi since the beginning. Their favorite tale is about their rarest find, a 12-piece octagonal silver tea and coffee service designed by Frank Lloyd Wright for his Imperial Hotel in Tokyo, which was torn down in 1968. All of the Wright silverware, except a creamer owned by his widow, was thought to have been melted down during World War II--that is, until nine years ago, when Jim Marrin discovered their set, unscathed and intact, at the Long Beach swap meet. Priced at $125, the service was gratefully sold for an even $100. It had been sitting in the dealer's antique shop in Riverside for years. Related: "On-Line Trail: Arts & Crafts at the Victorian & Albert Museum", An Exhibition including the work of Frank Lloyd Wright, 17 March - 24 July 2005. 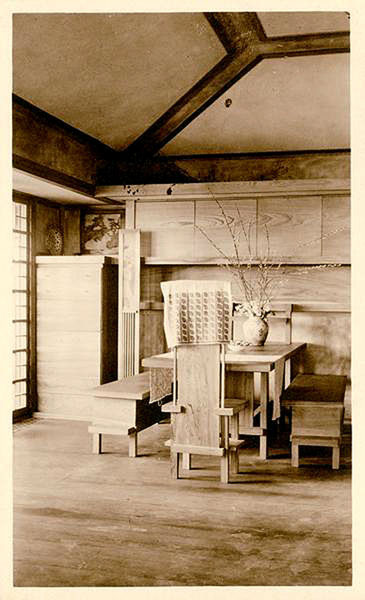 Exhibition includes Tea and coffee service with accompanying table for the Imperial Hotel, Tokyo, 1916-22. The service lent for display from a Private Collection, America. Courtesy of Bryce Bannatyne Gallery, Venice, California. Margo Stipe, Curator and Registrar of Collections, for the Frank Lloyd Wright Foundation Taliesin West, Scottsdale, and author of "Frank Lloyd Wright: The Interactive Portfolio", was kind enough to assist by contacting Wright colleagues at the Imperial Hotel in Japan. "Below is the response I received regarding the silverware and the logo. It is about as definitive as we are probably going to get on the logo, which is to say no one really knows. It seems like it should have appeared elsewhere with a clear Wright connection if he actually designed it, especially if, as the cutlery expert states, the silverware was designed before the hotel opened. That it only appears on the one coffee service drawing and then in different iterations seems curious to me. As if he had been asked to add it. But, that's just a thought." Imperial Hotel: "The Imperial Hotel brought in the cutlery expert today and he confirmed that the silverware service with the logo was designed for the Wright Imperial Hotel before it opened, to be used in banquets. He apologizes but says that there is no one at the hotel who can verify whether Wright himself designed the logo. "But it should have been approved by him, at least. Koichi and I have seen the stationery and somewhere, a brochure with the logo variation, and always felt they might have been done after both Wright and Endo left the hotel's employment. Lots and lots of cool, Wrightian things were created that echoed his designs, like the bubble motifs from the murals above the Treasure Room fireplace, which showed up on later brochures. "As for the logo-free creamer: the silver coffee service with the logo may have been used for fancier events and special guests, or perhaps was a prototype that Wright took home with him. The cutlery man didn't have an answer, really, but did say that there were many iterations through the years." The response from the Imperial Hotel confirms our initial impression that Wright did not design the silverware. As they stated, it "was designed for the Wright Imperial Hotel before it opened." (When you see the first Imperial Hotel it begs the question whether it was possibly first used there, fitting that style so well.) The question remains concerning the design of the "monogram or logo". Not only is Wright the foremost architect that ever existed, he was a prolific designer of other mediums. Furniture, art glass windows, sculptures, carpet, fabrics, wallpaper, books, murals, lighting, china, vases, to name a few, even including dresses. No detail was to minute. "... I can shake designs out of my sleeve." As you begin studying the details that embody the Imperial Hotel, it becomes overwhelming. Words fail to describe the Imperial Hotel. Staggering... Astounding... The attention to detail. That the mind of one man could conceive such complexity, and yet when each detail is combined, it becomes such a cohesive design. As Pfeiffer so expressly concludes, "Out of Wright's own imagination had to come each detail..." (V9, p145). The question comes down to whether Wright designing the monogram. The IH monogram is reminiscent of another detail from 1907, the design detail from the Avery Coonley carpet. The similarities are striking. When Wright took such an interest in the minutest of details, and when it is clear that he included the monograph on the coffee service design, it is hard then, to conceive that he did not have his hand on the design concept. The clearest conclusion seems to be that he designed the concept of the "IH" monograph, as seen in the original coffee service, but variations were used by the Imperial Hotel on items such as the silverware, letterhead, and other items. Text by Douglas M. Steiner, Copyright December 2009. Update September 2010. 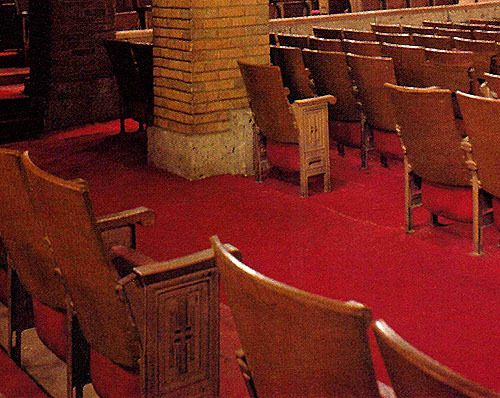 After discovering the "IH" design in the Auditorium seating, it confirms our conclusion that Wright designed the concept of the "IH" Monogram. Ausgef�hrte Bauten und Entw�rfe von Frank Lloyd Wright. 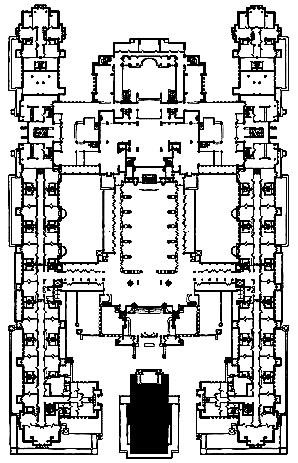 Plate LVI (56) "Studies and Executed Buildings", Wright, 1910. The IH monogram is reminiscent of the design detail from the Avery Coonley carpet. The similarities are striking. Detail of Plate LVI (56). The IH monogram is reminiscent of the design detail from the Avery Coonley carpet. Stylized tile by Motawi Tileworks representing detail from the Avery Coonley carpet. The IH monogram has similarities. "Architectural Record", October 1915, page 395. "The Nature of Materials: 1887 - 1941, The Buildings of Frank Lloyd Wright", 1942, Hitchcock, plate 177. "The Decorative Designs of Frank Lloyd Wright", 1979, Hanks, Pp 132-134, Plates 12, 13. "Frank Lloyd Wright and the Imperial Hotel: A Postscript", June 1985, Smith, The Art Bulletin, pages 296-310. 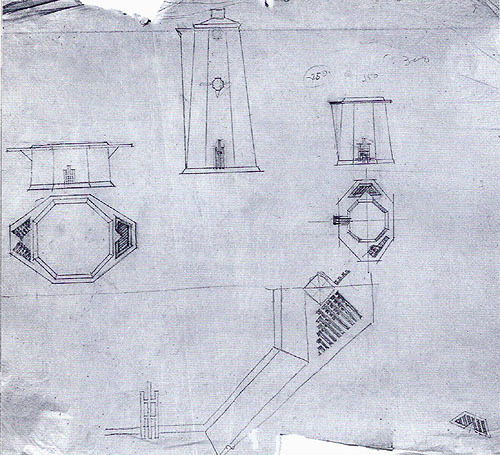 ﻿"Frank Lloyd Wright Preliminary Studies 1889-1916 Volume 9", 1991, Pfeiffer; Futagawa, pages 193-194. ﻿"Frank Lloyd Wright Preliminary Studies 1917-1932 Volume 10", 1986, 1990, 1991, Pfeiffer; Futagawa, pages 154-155. "Frank Lloyd Wright, Decorative Designs Collection", 1988, Frank Lloyd Wright Foundation. "﻿Frank Lloyd Wright In His Renderings 1887-1959 Volume 12" 1990, Pfeiffer; Futagawa, plate 61 & 62. "Taliesin 1911-1914", 1992, Alofsin, pages 108-113. "The Wright Stuff" Views from The Figge Art Museum - Fall 2009, pg 4, Exhibition includes Imperial Hotel coffee service. Imperial Hotel Items, by Douglas M. Steiner.